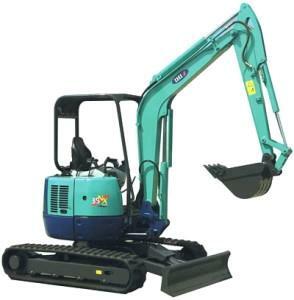 IHI 35NX; 26.5 HP; Tank Capacity: 10.6 Gal. Length: 15'; Width: 5'; Height: 8'1"; Max. digging depth: 11' 4"
Bucket capacity: 3.9 cu.ft. ; Weight: 7,440 lbs. IHI 30V4; 22.8 HP; Tank Capacity: 11.1 Gal. Lenght: 14' 7" ; Width: 5' 1" ; Height: 8'2";Max. digging depth: 9' 10"
Bucket capacity: 3.2 cu.ft. ; Weight: 7,100 lbs. * Please call us with any questions about our excavator 25 hp and over mini diesel rentals in Sacramento and Citrus Heights, serving Auburn, Placerville, Woodland, Davis, and Elk Grove in the Sacramento area.